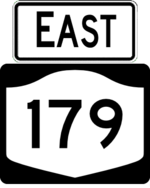 NY 179 is the Mile Strip Expressway, a short freeway running from NY 5 to US 62. The freeway was intended to be part of the Belt Expressway, an outer loop around Buffalo which would have connected to the LaSalle Expressway. 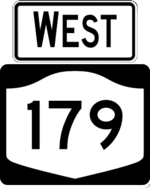 Originally curving into the Thruway interchange with an intersection with Milestrip Road, the roadway was realigned in 2001 and NY 179 was extended east to US 20 along a realignment and expansion of Milestrip Road.